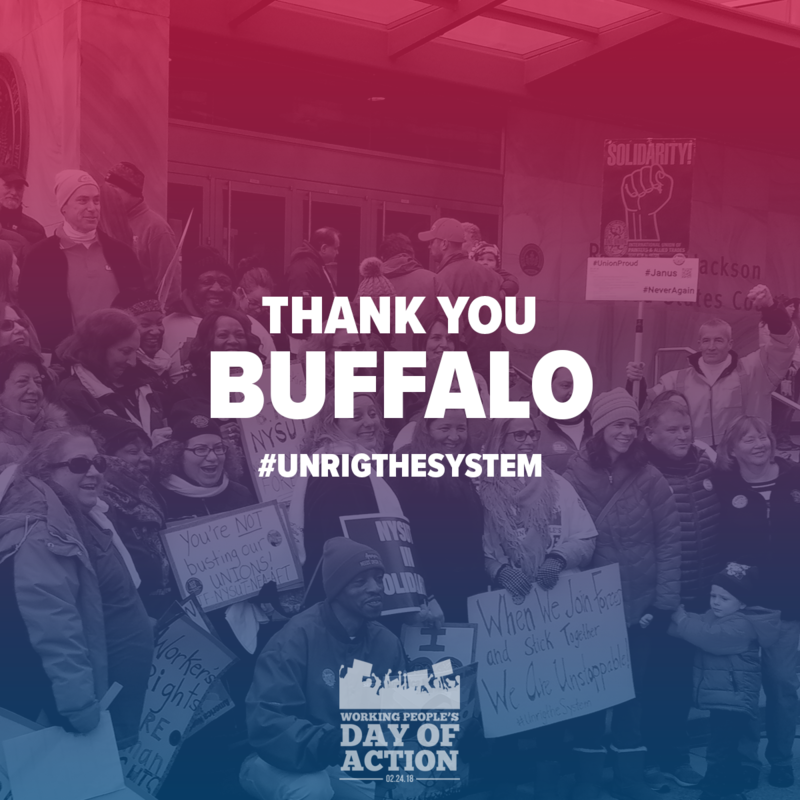 BUFFALO – February 24, 2018 – Members of the labor and civil rights movement mobilized for a rally on Saturday, February 24th to demand an end to the rigged economic and political system. Hundreds of demonstrators spoke out in front of the Federal Courthouse in Downtown Buffalo for the “Working People’s Day of Action,” as the US Supreme Court is expected to hear Janus v. AFSCME Council 31, a case that would rig the system even more against working people by taking away their freedom to have strong unions and their right to have a voice on the job. 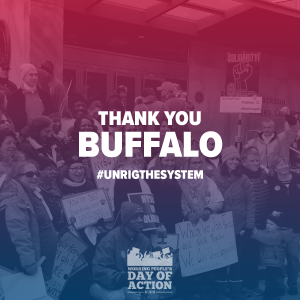 Buffalo’s rally is part of a nationwide day of action spanning 27 cities across the country. Local working people, elected officials and community leaders joined the call to end policies that benefit only the wealthy and powerful few at the expense of everyone else. It builds on the legacy of Dr. Martin Luther King Jr., who 50 years ago supported striking sanitation workers in Memphis, Tennessee, in their demand to join together in a strong union and to be treated with dignity at work. 50 years after this monumental strike, working people across all communities and backgrounds continue to struggle for better pay, benefits, and working conditions. Protesters were joined in solidarity by elected officials, including Congressman Brian Higgins. “All across the country, workers, parents, and students are gathering to say enough. The attacks on our civil liberties, our social justice and our paychecks have gone on for too long. 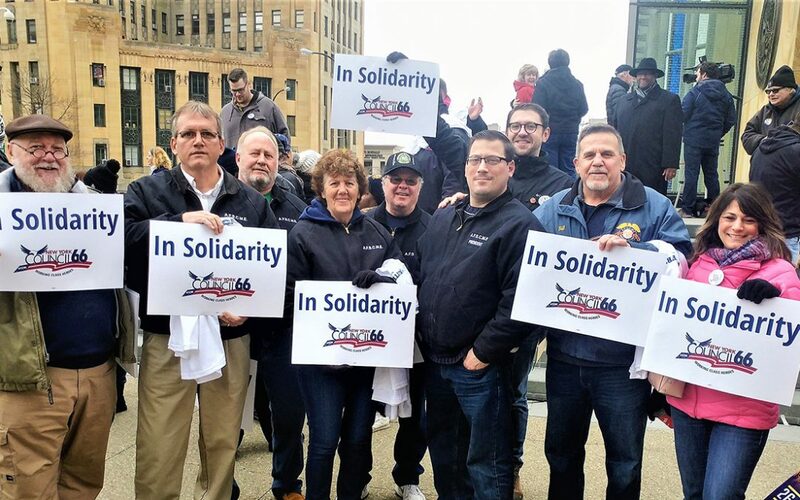 Buffalo is just one of many cities to stand up in the face of the constant attacks against working men and women,” said Terry Melvin, Secretary-Treasurer of the New York State AFL-CIO. Workers and their allies will remain committed to fighting against economic inequality and political exclusion. The Working People’s Day of Action is one in a series of events that will commemorate the 50th anniversary of the Memphis Sanitation Workers’ Strike while bringing attention to the present state of American workers.